Dough press turnover maker pierogi dupling press lumpia Temecula. This page contains dough presses, great for pierogi, turnovers, dumplings, and other snacks. 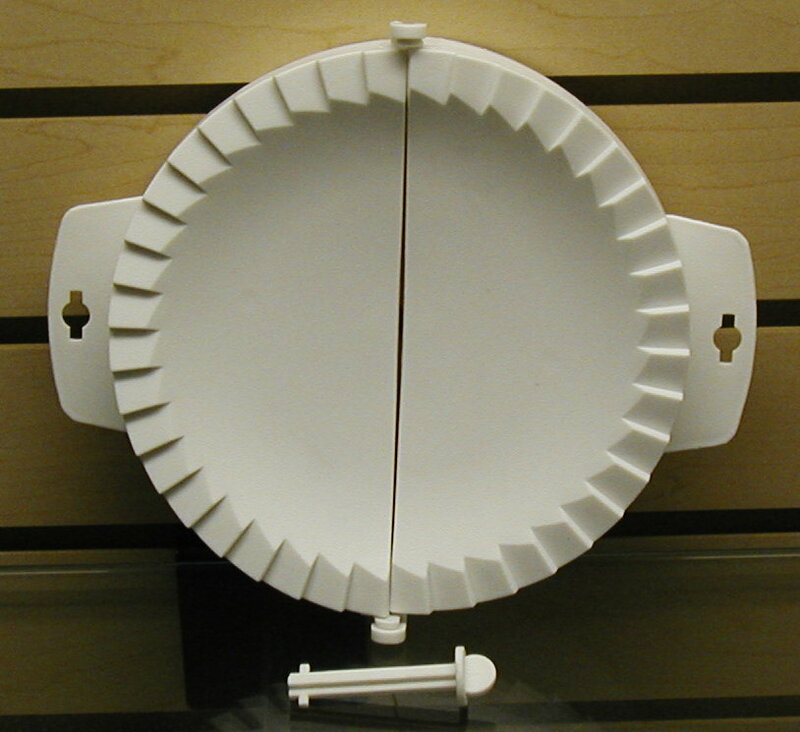 Plastic Dough press measurement is circular diameter, so a 6 inch press would be a 6 inch circle folded in half. Plastic. 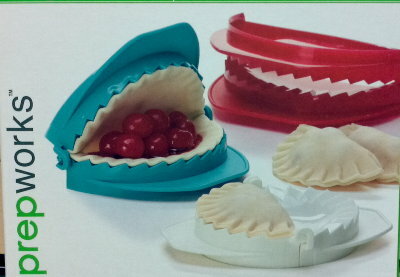 Simply place dough in press, add ingredients and press down, creating quick and easy shaped for tarts, snacks and more. Four different sizes. 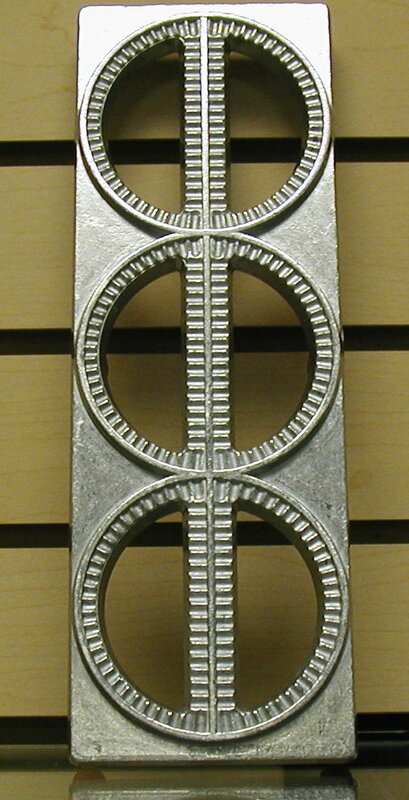 Set of 3 dough press 4", 5" 6" click picture above for detail. 1. Place on sheet of dough over form. 2. Use your thumb to gently make indentations in the dough. 3. Fill pockets with desired filing. 4. Brush edges with water or beaten egg. 5. Place second sheet of dough over form. 6. Roll a straight rolling pin across form with enough pressure to seal and cut pierogis. Dough press are great for making pierogi, dumplings, turn over's and other treats! BEFORE & AFTER USE: Wash dough presses with warm soapy water, rinse thoroughly and towel dry. Dough presses are top rack dishwasher safe. 1. Any biscuit, pie or pizza dough recipe may be used along with your favorite fillings. Italian calzones, Piroshkis, pastries, wontons, and fruit turnovers are just a few of the endless combinations you can make. 2. Notice that the bottom of the dumpling maker is hollow with a slight edge. This will enable you to cut out uniform sized dough rounds that will fit perfectly onto the top of the dumpling maker. 4. After cutting dough with bottom edge, carefully place onto the top of the dumpling maker and pat into the hollow and onto the "teeth." 5. Fill center with 1 to 3 teaspoons of filling for the small presses and 2 to 4 tablespoons of filling for the large presses such as gravied, deviled or creamed meats, poultry and fishes, cheeses, or fruit pie fillings. 6. Moisten edges of dough with water using small brush or fingers so that dough sticks together. Press dumpling maker together with light pressure to seal dumpling. 7. Carefully place dumpling on greased baking sheet and bake in 400*F to 450*F oven for approximately 20 minutes or until crust is lightly browned. 8. You may also deep fry the dumplings if you prefer (as for egg rolls), by preheating oil in a heavy skillet or deep fryer to 375*F and frying until golden brown. 9. It is very important not to overfill. BASIC DOUGH 2 cups all purpose flour, sifted 3 tablespoons butter 1/3 cup water 1/4 teaspoon salt Turn the sifted flour in a large food processor. Switch on and slowly add the water, butter and salt. Very suddenly it will turn into a ball. Turn out onto a floured board and knead for 2 to 3 minutes. Place the ball of dough into a bowl, cover with plastic and let it rest for 30 minutes. 2. In a large bowl, mix all filling ingredients. 3. Roll dough out very thinly(1/16i nch) with a rolling pin and using the bottom of the large dumpling press, cut out circles of dough. Pat dough into hollow of dumpling maker and onto the teeth. Place filling in the center of the dough. Press dumpling maker halves together with light pressure to seal well. Do not overfill. 1. Prepare dough. 2. In a skillet or frying pan, add butter and mushrooms, stirring frequently for 3-4 minutes. Add potatoes, pepper and paprika, cook for 1-2 minutes more. In business since 1984 family owned and operated! Proud to offer our dough press.